Red Flag Warnings for critical fire weather conditions have been issued for all of central and western New York for Monday afternoon. 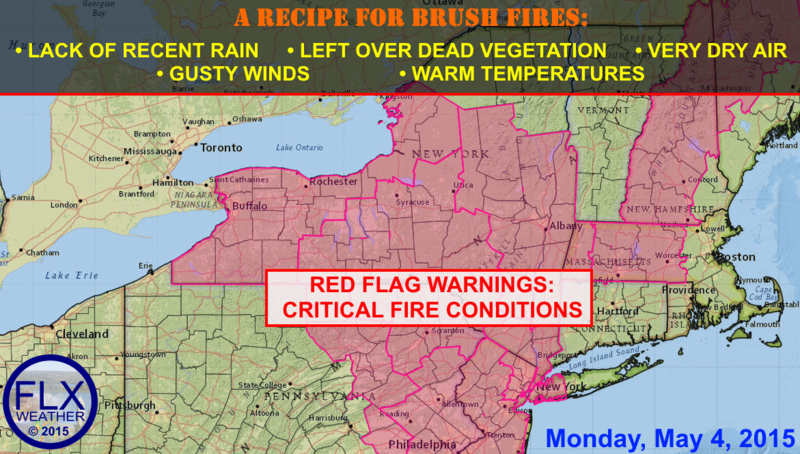 Red flag Warnings have been issued for the Finger Lakes and surrounding areas Monday. What is a red flag warning though? Red flag warnings are rather rare in the Finger Lakes, as our brush fire season is typically no more than a couple of weeks long. The specific conditions that go into a red flag warning as also quite specific and a bit difficult to meet. Today- this afternoon in particular- everything will come together for the potential for explosive growth of fires. Recent rainfall and the growth status of local vegetation also are taken into account. In this situation, we have had below normal recent rainfall and the spring green-up is not yet complete. Vegetation left over from last year is extremely dry and will quickly ignite. The warm temperatures and gusty winds will help any fires that start to quickly spread. Extreme caution is urged with any sort of open flame or spark today. Even a carelessly thrown cigarette could quickly ignite a large brush fire. And, of course, any brush fires can easily spread to buildings. The fire danger will drop tonight as a cold front moves through. However, this front will do little to help with our rainfall defect, as only a few showers will likely be able to overcome the dry air and actually wet the ground at all. A more widespread, but still light area of rain showers is possible Tuesday afternoon, but most of this could miss the Finger Lakes as it moves south. The rest of the week looks very summer-like, with temperatures in the 70s and 80s with more dry weather. The next chance for rain after Tuesday will not be until the weekend, when enough heat and humidity are in place for some pop-up thunderstorms.